Getting a new puppy or dog is an exciting event, full of new possibilities and experiences for everyone involved. Along with arming yourself with the essentials such as a new leash, bowls, food and treats for your new four-legged friend, planning to socialize your new pet is an important part of setting you both up for long- term success and happiness. Whether you are bringing home a brand new puppy, or adopting an older dog, socialization should be on your agenda. Socialization should be started early, but it is also an ongoing process. As a pet parent, you want to expose your puppy or dog to positive new experiences, places, people, car rides and other dogs consistently, so they become well- behaved, adjusted, and are able to easily adapt to new situations. Socialization also helps to forge strong bonds between you and your dog; by exposing them to new environments, dogs and people in a gentle and encouraging manner with positive interactions and results, your dog will learn to trust that you have their best interest at heart. Poorly socialized dogs may exhibit behavioral issues such as displaying fearful and aggressive actions towards other dogs and people, as well as being unable to engage in safe, ritualized play fighting. If you are bringing home a new puppy, the most important time to socialize them is between 4 and 16 weeks. During this time, your pup will be the most receptive to learning, and the things they are exposed to during this time they will be much less likely to fear. Enrolling your pup in puppy training classes is a great way to start the socialization process. A well- run puppy class will allow your puppy to meet and interact with other puppies of the same age, along with their owners, and focus more on teaching plan than strict obedience. If you are adopting an older dog, the same schools and instructors usually offer obedience courses for older dogs, which may be more appropriate for your new friends to partake in than those geared towards young puppies. Whether your new furry friend is a young pup or an adult dog, exposing them to the people, places, other dogs and situations that they are likely to encounter as your companion is very important. Outside of structured classes, you can introduce your new pet to family members, friends and neighbors who have well- known gentle dogs. Arrange for people to visit your house with their dogs for play dates, or go visit them at their houses with your pup; once they’re old enough, go for walks around the neighborhood and introduce your pet to the friendly neighborhood dog crew. Using ‘socialization cookies’ as a tool can also be very helpful when introducing your dog to new people and places- carry small treats around with you and give to your dog when they exhibit good behavior in new places. When introducing them to new people, let the newcomers offer the treats, so your pup learns to expect good things of strangers. At home, be sure to expose your pet early and often to things that are loud and may startle or scare them- vacuums, washing machines, blenders, etc. so they become accustomed to those noises and routines. Bringing your dog to the groomer early on is also a helpful tactic, so they learn that being bathed and having their hair and nails clipped is a normal event and not something to fear. 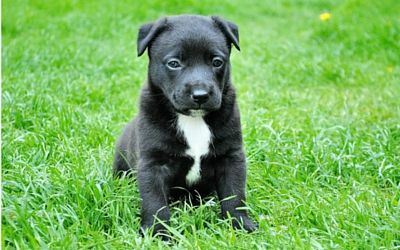 Making the effort early on to socialize your new dog, using the tips outlined above, is an important part of raising a well- behaved pet whom you can be confident of in any situation. Keep in mind that socialization is an ongoing practice, and taking your dog to as many new places as possible while introducing them to new people and dogs on a consistent basis will likely create a happy well-rounded pet and a healthy pet- owner relationship.